With no media event this week, Galway have done their best to keep a low profile ahead of Saturday’s All-Ireland semi-final against Clare. Perhaps they were hoping to quell some of the expectation that is building up around their team because the bookmakers look to have made up their mind on both this weekend’s game and on the destination of the Liam MacCarthy Cup. Even ahead of the clash with the Banner, the Tribesmen are odds-on to retain their title. And former Tribe star Damien Hayes agrees that they are the team to beat as the semi-finals come into view. “I think it’s a brilliant Galway team,” Hayes said at the launch of the EirGrid Moments in Time competition, which gives a club in each province the chance to win a LED digital clock and scoreboard for their ground. “I think they are big, they are strong, they are powerful, they are athletic. And they are using, realistically, the same 19 players in the Championship in a season. All things being equal, Hayes expects Galway to win on Saturday, but insists Clare do have the tools to hurt Micheál Donoghue’s side if they are off their game. Hayes knows Clare’s star man Tony Kelly well. 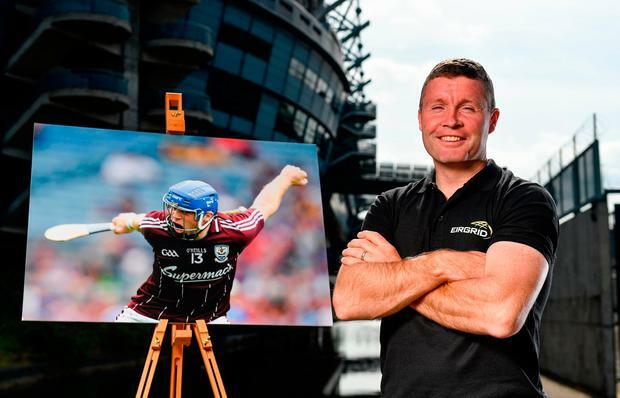 He is a Skoda ambassador in Ennis for Hayes’ family business, All Hayes Motors, and reckons Galway will face the best six forwards they have seen this year. “Tony has 1-20 from play scored, (John) Conlon has 1-22 from play scored, Shane O’Donnell is after coming off a performance of four points from play,” said Hayes. “Podge Collins is scoring from play, (David) Reidy is scoring. (Peter) Duggan as well, and they have settled with Duggan on free-taking. “I’m hoping it’s going to be an absolutely cracking game, number one. I think Clare will thunder into this game. “Clare got a huge monkey off their back with a lot of confidence from beating Tipperary. I feel they blew a Munster Championship, absolutely blew it. “They were very cautious going into the Wexford game and now they are in the semi-final with an opportunity to play the All-Ireland champions. Hayes watched on last year with mixed emotions. He was obviously delighted the county finally got over the line, but a part of him wished it came in his time. He also felt for the likes of David Collins, Fergal Moore and others who had brought Galway to within touching distance of an All-Ireland before the panel insisted on a change of management in late 2015. “You’ve to remember that the Galway players had their meeting to change their management. I wasn’t at the meeting, but I’ve no doubt that those guys would have been to the fore as well of maybe getting management changed where the players weren’t happy. Hayes believes that Galway got their wake-up call in the drawn Leinster final with Kilkenny. “Kilkenny should have won it because they had an awful lot of missed chances, but it was a kick up the backside and it was a wake-up call, and the first 25 minutes against Kilkenny in Semple Stadium they were unbelievable,” he reflects. “Now Kilkenny were always going to get their own purple patch and they did in the second-half. Did they bring it back to a point with Richie Hogan’s goal? But then Galway pushed on again. “There was a little bit of leadership, a little bit of game management on show there.